4) Exact weight of item. Please do not send any queries without all of the above materials. 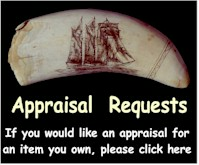 We do not accept orders for appraisals by telephone. items that weigh more than 1 pound. You may be required to provide additional information. When ordering an appraisal, you must click the order button. All appraisal orders are final and not refundable.